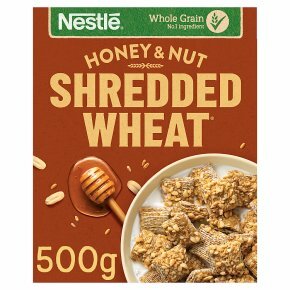 NESTLE SHREDDED WHEAT Honey & Nut is a deliciously nutty breakfast cereal. Crispy, toasted SHREDDED WHEAT bitesize biscuits topped with honey and nuts. No artificial colours or flavours. Low in saturated fat, very low in salt. Made with 84% wholegrain wheat, sown & grown in Britain. High in fibre.NESTLE SHREDDED WHEAT Honey & Nut breakfast cereal is a simply delicious nutty treat for your tastebuds! Crispy, toasted SHREDDED WHEAT bitesize biscuits topped with yummy golden honey and crunchy nuts. It's high in fibre and made with 84% wholegrain wheat which is grown here in Britain. Did we mention, it has no artificial colours or flavours, is very low in salt, and low in saturated fat too! A scrumptious honey and nut breakfast that's packed with taste for all the family to enjoy - Nutty but nice! Serve with cold or hot milk, and why not try with fresh fruit and yoghurt.